Today, celebrating parents birthday parties is becoming a huge tradition in India. Long back this was not the case. 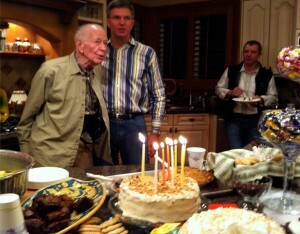 Birthdays are always a wonderful occasion to let people know how much they are valued. Celebrate your parents birthday party in great regard and let them know how important they are to you.Parents are the most important people in our life. It took a lot of hard work and sufferings from their part to make you into what you are today. Parents Birthday Parties are becoming very common in India today. Sending invitations for the party is a very important matter. In India, relations and friends are considered so important and it would be really mean if you miss inviting any of your close relatives to the party. 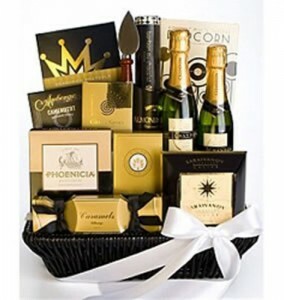 The best option is to use an online invitation tool, which can help you draft out the invitations and send them to all. There are so many free invitation tools online that allow to send invitations easily.Decorations are also an important part of parents birthday party. You can use all your innovation to get the party hall decorated. If you are planning a surprise birthday party, then it is best that you use the time when your parents are not at home to do the decorations. Use balloons, colorful ribbons, crepe papers, confetti and other such decorative items for your decorations. You could also use some nice memorable photographs to complete your decorations for the parents birthday party. Try to get a nice gift for your parents as well. 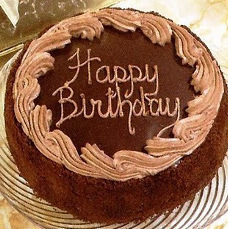 Birthdays are when everyone would love to be pampered and treated special. Get a gift to make your dad or mom feel extra special. They would be delighted at the thought and would not even care what is in the box.Take care of the menu as well. If you are inviting a lot of elders, then it is best that you stick to an Indian menu. 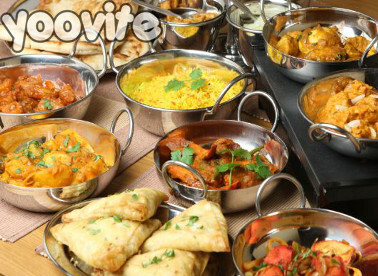 In case you have a few elders along with a lot of youngsters, then you could have the Indian delicacies ordered specially for the elders who would not find it easy to try out new tastes.Plan your parents birthday party in advance so that you don’t miss out anything. With a little extra planning, you can make your parents feel really special on their birthday. Bangalore is indeed a favorite spot for the young and restless. There is a lot of hustle and bustle in this garden city and the colorful atmosphere, pulsating energy and lovely climate beckons you to the city and it is really worth a visit.The city has also a very wide range of exotic and traditional cuisines in the offer. This city is a one-stop destination for the most heartiest meals. Tantalize your taste buds with the best delicacies while you are visiting this city. If you would like to host a party in Bangalore, your best choice would be something from these best restaurants in Bangalore. The Jamavar Restaurant in the Leela Palace Hotel of Bangalore is a great place to host parties. They can seat over 100 guests and you can have your party in 5 star style when it is hosted here at Jamavar Restaurant in Bangalore. Another among the best restaurants in Bangalore is Samarkand. There is a delicious spread of Afghani cuisine and biriyanis and kebabs served here are more than amazing. This is another name in the list of best restaurants in Bangalore.For those who would like to make seafood the main part of the party menu, Karavalli would be the best option. Here you can get them to serve coastal Indian food on the banana leaf. Host your party here if you want to impress your friends and relatives with the best seafood cuisine.If Chinese food is what you prefer, then you must head to Mainland China in Bangalore. The most authentic Chinese cuisine is served in a brilliant décor and offset. This is a very popular name among the best restaurants in Bangalore. The Empire is probably the most desirable and among the best party hotels in Bangalore. Grilled chicken, Kebabs and there is much more to taste in here at this mouth-watering restaurant in Bangalore.The above mentioned are among the best party hotels in Bangalore. So, for all who are looking to host a party in Bangalore, choose from these best restaurants in Bangalore. Marriages mean a lot of pomp and splendor in India. Indian weddings are famous all over the world for their decorations, food and enjoyment that these parties offer. You definitely want to make your wedding very special.The most important thing for this is that you plan well ahead and make all the arrangements perfectly. Make sure that you do not have to run around in the last minute for wedding reception preparations. There are so many points you have to consider when you are planning your wedding day celebrations. 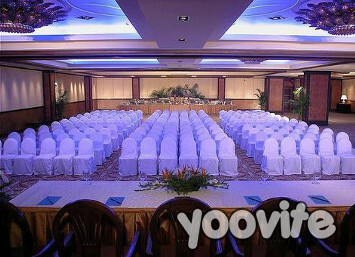 Booking a nice wedding reception hall is a very important decision and it depends on a lot of factors. One of the first things that you will have to take care of is the total budget of your wedding. It is based on this budget that you will make all the further arrangements for your weddings. You cannot make the mistake of going too much over your budget. 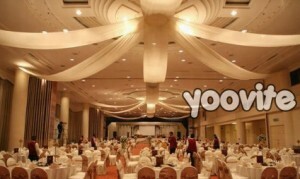 Wedding halls are available in all budgets. You can choose the hall of a five star hotel or a normal hall which can be decorated elegantly for the day.Another point that has to be considered before you choose your wedding hall is the number of guests on your list. You should not choose a wedding hall that can accommodate just 100 guests when you have invited over 500 guests. So make a rough count of the guests before you decide on the wedding reception hall.There are so many kinds of facilities that all we have to look at when you choose the wedding hall in India. Make a list of everything you need in the hall for your wedding reception. After this, check online for the different wedding halls that will work for your conditions and alongside check the prices as well. If you require room accommodation for your out-of-town guests, that also has to be taken care of.Most of the wedding reception halls also offer food for the party as a part of the wedding package. You can check the different kinds of cuisine that is offered and choose the best one that suits your guests. Indian weddings usually include the region’s best delicacies for the wedding reception party.Decorations for your wedding reception hall are also a very important matter. 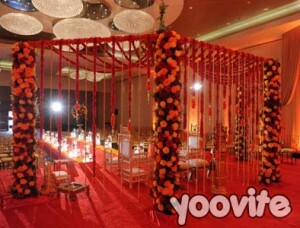 With some fresh flower decorations, you can make your wedding hall look like your dream. 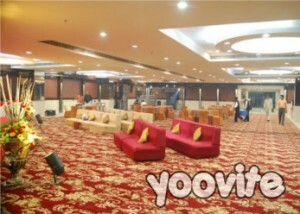 When you choose your wedding hall, you have to make sure that it offers all major facilities for your guests. The reception hall that you choose must not be inconvenient to your guests in a big way. It is very important to choose the right wedding flowers for your wedding décor. These flowers often set the mood of the function and it is essential to make your preferences based on the general theme of the wedding and some other factors as well. Here are a few things that you must keep in mind when you are choosing flowers for wedding.The most important thing that you have to decide before you choose wedding flowers is the theme of the wedding. Suppose you are planning a traditional Indian wedding, then the best choice of flowers for your wedding décor would be Marigolds or Mogras. On the other hand, if you are going for a contemporary wedding style, then you must choose flowers like Gerbera or Roses. Remember, these are going to be more expensive than the local flowers. Another important point you have to think of is the size of your wedding venue. If you are planning a huge venue, then the sensible option would be to go for less expensive flowers. However, if you are planning the wedding outdoors, then you have to choose flowers that can stand harsh sunlight or heat for a longer time.It is important to allocate a budget for wedding flower decorations. Flowers definitely add a positive aura to your wedding. However, you must note that some flowers can be really expensive. It would also be nice to find discount wedding flowers for your need as this would greatly reduce your budget.It is also important to choose a reliable vendor who will make sure that they will deliver your flowers. There would be situations where a particular flower is not available in the market. A reliable vendor would immediately be able to find you the best way to get the flower for you or provide you with the next best option.You also have to decide if you would like to go with a single type of flower for the entire arrangement or want a combination of flowers. Make sure the combination works well with your theme.Another point you have to check is that the fragrance of some flowers could be really strong and overpowering. It is best to go for flowers with subtle and refreshing scents. There are so many good options for florists in Bangalore, Mumbai, Chennai and all major cities of India. The best floral decorators will also have photographs of their previous floral arrangements which will make it easier for you to choose. 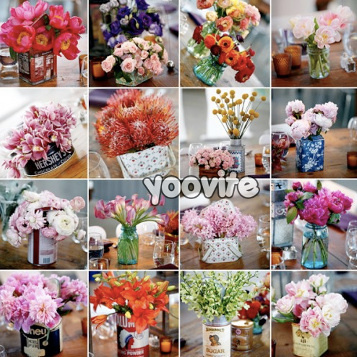 Hope these tips help you create a totally dashing wedding floral décor! 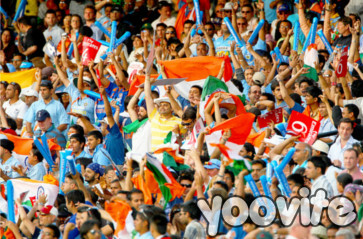 Cricket is more like a religion for Indians. It has even more popularity than the national game, hockey. No Indian would ever miss a final cricket match with India playing against other teams. However, most of us prefer to stay home and watch the live telecast of cricket in the comfort of our living rooms.It would be amazing if you could get together with your friends and watch the game together. It can be a party where the main agenda is watching the game together. 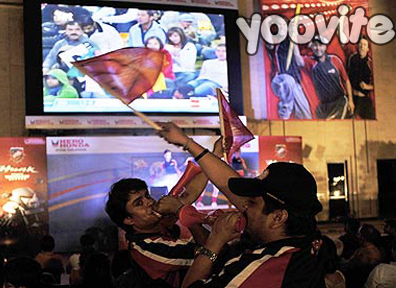 Cricket fans would love to cheer the team together. Thus, a cricket watching party is indeed a great idea.Though everyone would know the date of the match, no one would know you are holding a party unless you invite them. 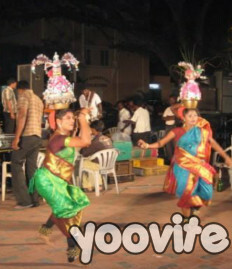 Party invites in India has just become so easy with free online invitation tools like Yoovite. The best place to hold the cricket watching party is somewhere there is a nice widescreen LCD TV. You must invite carefully. It would not be very convenient if so many people were stuffed in the room. Even if you don’t have enough couches, you can just lay out some nice carpets in front of the television. You must also arrange Indian snacks for the party. Arrange several packets of Lays, Cheetos, Kurkure, Fried Cashews, Peanuts, Banana Chips, Moong Dal, Bhujia, popcorn etc. as simple snacks. Other popular dishes would be French Fries, meat balls, chicken nuggets, fish fingers, burger, spring rolls, sandwiches etc. You could also order pizza for dinner if the match is going to be late night.You can also plan some drinks for party. You can get soft drinks and if it is going to be guys alone, you could get some beer too. Dinner parties are very common in all major towns and cities of India. You must do good party planning when you are going to have a dinner party at your house. Such dinner parties are the best way to get together with your friends and family. You must organize a world of fun, games and entertainment for the night. Though it is not tough to get everything planned, you must make sure that you don’t miss anything.The most important point is to get the date and venue planned. Such dinner parties are held mostly at home. The themes for party have to be chosen and you have to plan a few weeks in advance so that everything goes well. The decorations have to be in accordance to the theme of the party. Inviting Guests is the next important step. You can use free online invitation cards to make your invitations more organized and personalized. The date, time and the venue have to be clearly mentioned on the invitation card. If you are planning a particular dress code, then make sure that you mention this also in your card. The easy to use RSVP option allows you to get an early acknowledgement from the guests. Thus you could get a rough idea of the number of people attending the party and plan accordingly. The arrangements have to be done carefully. The dinnerware has to be cleaned and arranged well. If you are organizing party caterers for the occasion, then you must ask them to be present well before the function begins. You definitely don’t want to keep your guests waiting for the food. Disposable plates and glasses would be a really convenient option. You must also arrange enough trash bags where the guests can dispose the used plates and glasses. The menu for dinner party has to be decided according to what your guests would like. For the older lot, it is always best to go for regional dishes. The youngsters would love to have something continental. You must also make exotic dishes which could be allergic to some people must clearly be avoided. If you are looking for something other than Indian cuisine, you could try Chinese, Italian or Japanese. If you are including alcoholic beverages for the dinner party, you must be careful that everyone you invite are responsible drinkers. 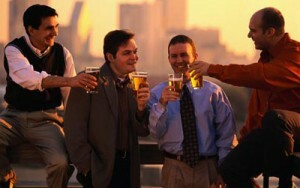 Wine and soft drinks can also be arranged for the people who would not enjoy alcoholic beverages. Charity Events are becoming really common in all major cities of India like Mumbai, Delhi, Calcutta and Pune now. 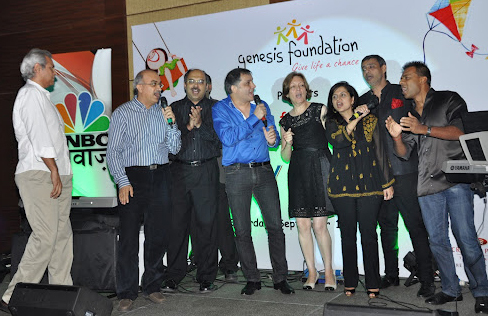 There are so many huge companies conducting big charity events in India these days. 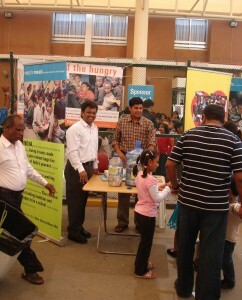 It would take several months to properly organize a huge charity event in India. You can get your invitations done in a jiffy using the free online invitation tools available online. When you use these tools, you can be professional and make sure that you have not missed anyone from the list of invitees. This is really very important when you are holding a charity event in India.You must decide the kind of event that you are going to have for fund raising. If you are having a really formal event, then you could get hold of the most important businessmen and entrepreneurs. If you are planning on a more informal event with loads of entertainment programs, then you can decide on a theme and make the program revolve around that. This way, it would look more organized and professional.You must not forget to invite all the potential guests for the charity event you are holding. If you can get hold of a very popular guest of honor, then you can be sure that the turnout for the program will be huge.You need nice volunteers for charity event in India. Make sure that you arrange volunteers who can be active all through the event. You don’t want to be the only person running around for everything in the event. You must make the plans work out well. Every job has to be assigned to the concerned volunteers in time and you have to also make sure that they get the job done before the eve of the function. Good Friday is a very important day for Christians across the world. The crucifixion of Jesus Christ is commemorated on this day and there are so many activities performed on the day. 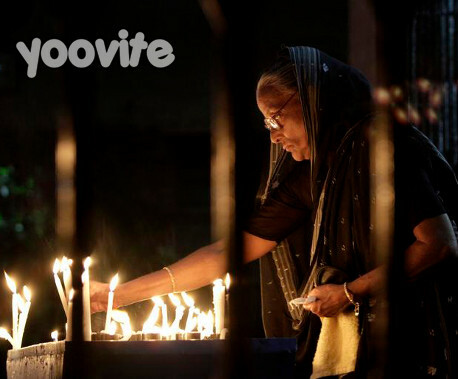 Good Friday is holiday all across India and you can use a free online invitation tool like Yoovite to take care of the invitations for the day. All the functions for Good Friday revolve around prayers and rituals. Most factions of Christians include fasting as a part of the Good Friday celebrations. The Orthodox faction and the Roman Catholics have a lot of rituals for the day, whereas the Protestants don’t have as much as the others.There are so many songs and hymns for the occasion and all the members of the church get together to sing them and praise Jesus Christ on the occasion.You can involve in several other activities on Good Friday. Some of them are as follows. One among these fun activities include planting seeds. The planting of seeds on Good Friday will symbolize the resurrection of Jesus Christ on Easter.You could also involve the kids in coloring pictures that depict about the importance of the day. There are so many sites where you can download coloring pages of crosses, Jesus Christ, lambs, flowering vines and bread and either paint yourself or have your children do it. 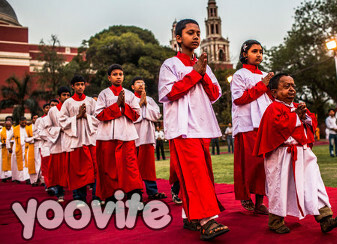 Another very popular activity that happens for Good Friday celebrations in India are processions. The church masses take a holy procession and sing hymns to remember Christ’s sufferings on the cross.After the church functions, you can also get together with your friends and family and watch movies that show you about the crucifixion of Christ like Passion of the Christ. You can also include other movies that depict the history of Christians like Jesus and The Ten Commandments which are popular all around the world. There are harvest festivals celebrated in all parts of India. In Karnataka and Tamil Nadu, the end of the harvest season is celebrated as Pongal. The celebrations usually begin in mid January and the celebrations go on for four days.The first day is called Bhogi Pongal and is dedicated to Lord Indra, the rain God. The second day of Pongal Celebrations is devoted to Sun God Surya and is known as Surya Pongal. The third and final day of Pongal, called Mattu Pongal is to honor the Goddess Parvathy and her son Lord Ganesha and is dedicated to the cattle and other animals. The fourth day, known as Kannum Pongal is the final day, when families relax and have a scrumptious lunch with everyone. This day will also have folk dance performances with music in almost all villages in Tamil Nadu. Pongal is like an Indian version of the Thanksgiving festival celebrated in other parts of the world.The festival of Pongal also marks the beginning of a new year in Tamil Nadu. Just like all other festivals in India, Pongal is also celebrated in great pomp and splendor. The most important thing that people do before the Pongal celebrations begin is decoration of homes with flowers and rangoli, which is known in Tamil Nadu as Kolam.So many rituals are held for Pongal Celebrations in India. One of the most important rituals is feeding the cattle, a special rice dish called Pongal made with the newly harvested rice.A common ritual for all three days of the Pongal festival is cleaning of homes and decorations with Kolam and flowers. The devotees also wear new clothes and present flowers and Pongal to idols of Lord Ganesha.On the third day of Pongal celebrations, the cattle are also bathed, decorated and then paraded through the villages. Most of the places in Tamil Nadu also hold cattle races and bullfights, which are known here as Jallikattu. There are bags of money tied on the horns of bulls and young men can wrestle with the bulls to win the bags. It is almost important for people to get dressed in new clothes for the Pongal Celebrations. Women and Girls usually wear half saree or saree and men wear lungi and angavastram. In the modern settings, almost any kind of decent wear is allowed, though most stick to the Indian styles. Tamilians in all major villages and major cities like Mumbai, Chennai and Calcutta celebrate the festival of Pongal in great harmony. 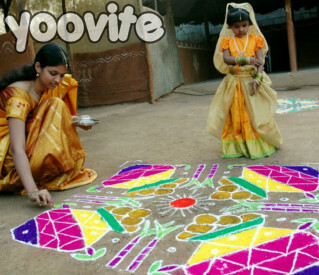 Kolam is also a very important part of the Pongal Celebrations in India. It is just like rangoli, but the color is all white. There are some really intricate designs that are drawn in front of the Tamilian houses especially for Pongal. Some places also hold Kolam drawing competitions for the kids during the festival. Like all other festivals in India, there are gifts for Pongal also. The farmers usually get ‘Pongal Padi’ or ‘Pongal Parisu’ as gifts from their landowners. Sculptures of God, new kitchen vessels, wooden handicrafts, Pongal Sweets and household goods are the popular gifts for Pongal.